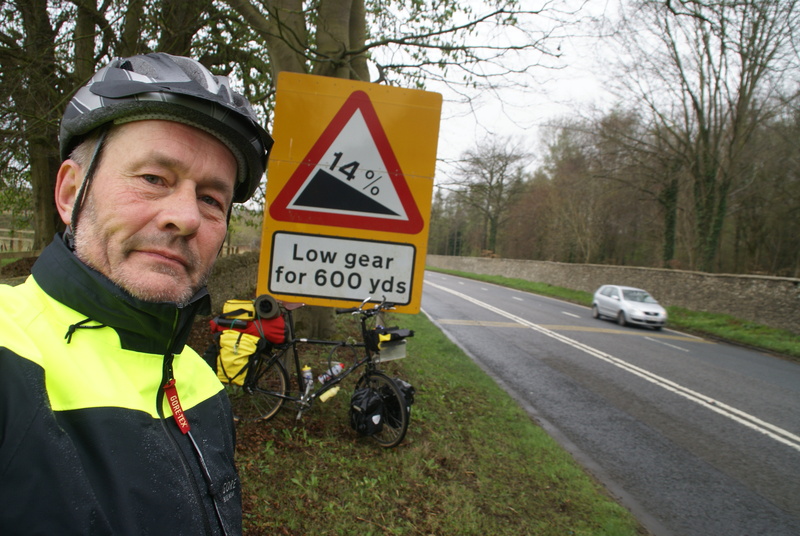 Forty miles north-east from Cirencester to friends near Banbury, and neither wind nor rain, nor even hills proved as challenging as I persuaded myself to expect. Averaging just eight miles an hour, progress across Europe will be slow – heading for Cambridge tomorrow, then Harwich, Hook of Holland, Munster, Bielefeld, Hanover, Magdeburg and Berlin, and on to Moscow via the Baltic (details anon). But good news is that I have probably already negotiated the biggest hills between Cirencester and Russia, along the old Fosse Way Roman road out of the Cotswolds. And despite a good 30kg of gear and 25kg of bike, I didn’t need to get off and push. After a long period of health wobbles, something must be going well, with knees and neck and Raven’s nearly 62-year-old engine. Departure from Cirencester was enormous fun – with neighbours Edward and Rosemary, and local friends Meg and Jeff, and Clive and Jane from London specially come down to wave me off and keep Sue company for the first of some 120 days’ separation until we meet in Hanoi in August – all there for flag waving and hugs, and after months and months of planning for departure only 15 minutes later than intended. 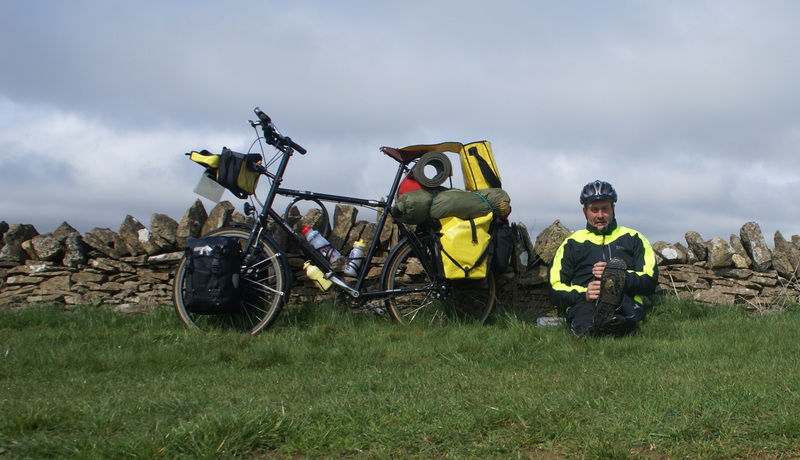 Thanks too to Steve and Ricky for pacing me slowly, slowly for the first five miles or so out of Cirencester into an almost benign North-Easterly, with even some sunshine. Just five hours or so riding, musing on the joy of being out solo on the open road again, and contemplating what I might want to say in blogs as the journey unfolds. Though I do promise, with nods in son Alastair’s direction and his warnings of being viewed as spam, not to do this more than is reasonable, and certainly not every day. First day concluding therefore with an evening with all the J’s at Sandiacre Farm – old friend from Moscow student days Judy, her surgeon husband Jeremy, and daughter Julia, now completing a degree in broadcast journalism and settling in, as youngsters do, to an overnight marathon on her dissertation, close to home on war journalists, embedding and objectivity. To all today, warmest thanks for the best of departures and a fabulous welcome and reminisce about those extraordinary and formative times 40 years ago in Cold War Russia. Moving writing Mark! I have clear images of the first day of your exciting journey. So pleased to read such success already! Well, Claire, early days. So nice to know you’re following – and keeping Mum up to date too. Main thing is – neither neck or knee (or is is kneck or nee) have fired up, so at this point, sitting in a warm warm pub on my second evening, I’m most hopeful. Carol’s, easily, tomorrow. Love. Hallo. I’m a friend of Lynne Whitworth from college days in Bath. ( She has just sent me details of your trip) I now live near the B68 road between Osnabrück and Bielefeld in a small town with a big heart called Halle. Should you be aware of passing through it you could have a stop at my place.Turn left immediately after the Lidl on the left hand side into a road called Else Brandström and then left again into my road Albert Schweitzer Str. I live right at the top at nr. 10. Pat Marlow is the name and you are welcome to stay and have a refreshing stop if you find me in; Good luck. Stay safe and on the right side of the road! That’s a lovely invitation, Pat, and many many thanks. Sadly, I shall be passing rather too many km south of you, from Muenster to Bielefeld and then on to Hanover, so thinking bike, it’s probably going to be too much of a detour. But thanks anyway – I’ve made a good note of your address, and if the wind should strike me north, as one might say in German, I’ll certainly let you know. Best wishes. PreviousForecast of 45mph headwinds – why am I doing this?